All texts, charts and pictures are protected under the Copyright Act. Any use of the material is only permissible if it is explicitly approved of by the FRANKFURT HOSTEL. The pictures being used to compose this homepage have been made available by Interalp Touristik, photocase.com and the partners of the FRANKFURT HOSTEL. 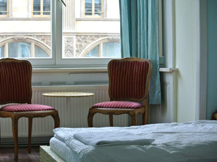 The FRANKFURT HOSTEL assures you that your personal data are being treated confidentially according to the prevailing data protection guidelines. After inquiry you get further details about the data stored at the FRANKFURT HOSTEL and if necessary you can correct, delete or stop the data. If you object to the processing of your data in the end you can oppose to it free of charge. The FRANKFURT HOSTEL neither has the intention nor the obligation to revise or to actualize these statements, whether as a result of new recognition, future happenings or other factors of influence.